Second in the series of background for the Judge Dredd game. Publisher's blurb: "This volume covers the most famous judges to have graced the streets of Mega-City One, bringing their own brand of instant justice to the streets. 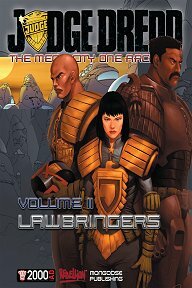 From the most recognisable faces, such as Anderson, Dredd and Giant, to those who attained the heights of Chief Judge, and even the few corrupt judges, Lawbringers provides a complete biography on each, charting their successes and failures." More when I get hold of a copy!